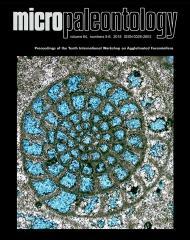 ABSTRACT: A time series of three closely-spaced data sets are used to track the early expansion of the invasive Japanese benthic foraminifera Trochammina hadai in the southern portion of San Francisco Bay known as South Bay. The species initially appeared in 1983, comprising only 1.5% of the assemblage in one of four samples that were dominated by the native species Ammonia tepida and Cribroelphidium excavatum (means = 60.2% and 33.8%, respectively). By 1986, census counts and R- andQ-mode cluster analyses document the explosive growth of the invasive as T. hadai now dominates the assemblage (mean = 42.7%;max = 88.7%)with associated declines in abundance of A. tepida (by greater than one-half; mean = 26.8%) and C. excavatum (by greater than one-third; mean = 20.6%). The invasive continued to dominant the assemblage in 1987, spreading even further to the north and south in South Bay, although its average abundance dropped slightly (~2%) as did those of A. tepida (~3%) and C. excavatum (0.4%). A rare increase in abundance of Elphidiella hannai and the appearance of numerous coastalmarine species in the central portion of the bay are thought to be the result of an incursion ofmarine waters into South Bay due to the prevalent drought conditions in 1987. Clearly, the rapid decline in abundance of the formerly dominant species A. tepida and C. excavatum in South Bay from 1983 to 1986 that continued into 1987 suggests the introduction of T. hadai in the bay severely impacted the native population.